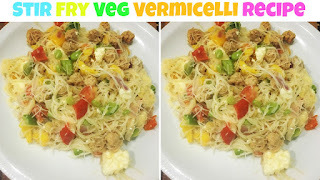 Put vermicelli noodles in hot water or boil them for few minutes. Re-hydrate Soya Chunks by dipping them in water for few minutes. Heat olive oil in a pan and add finally chopped green chilies, ginger and garlic. Stir everything for for a while. Now add re-hydrated vermicelli noodles and stir them well. Then add 1 tsp of light Soya Sauce and stir it for a while. And Voila!! Yummy stir fry veg vermicelli is ready !! 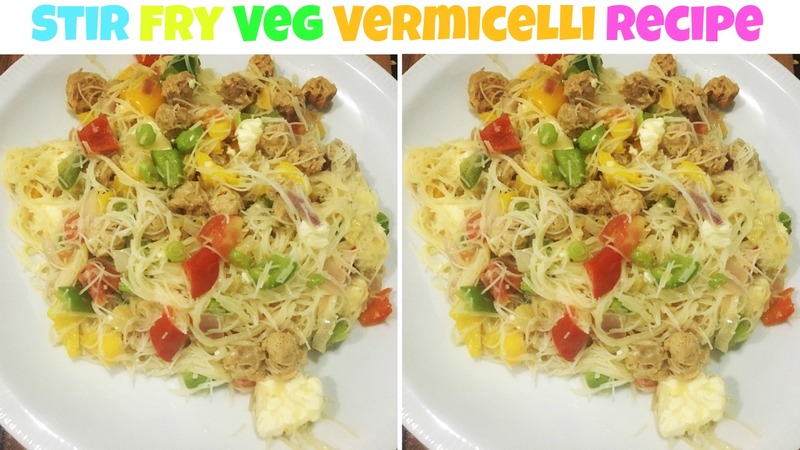 You can also watch My Stir Frey Veg Vermicelli Recipe on YouTube ! Try this recipe and do let me know how it turned out for you! You can also share your pictures with me on Insta-Stories by tagging me. I would love to see them.! !